After the Galleria, we hit up the ongoing demo at Fashion 21 in Highland Park. Fashion 21 is the first store in the Forever 21 empire. It's where it all started. Photo by Mike Snow. Sorry I'm not posting the usual "picket" photos. Look, you've seen one picket line, you've seen them all. What you need to do is see the thing live, talk to some people to find out the latest news, and write letters and make phone calls. This week's demo was joined by UNITE, the needle trade union, who earlier organized a picket at the GAP in Pasadena. They were joined by the Billionaires coming up from the Galleria. 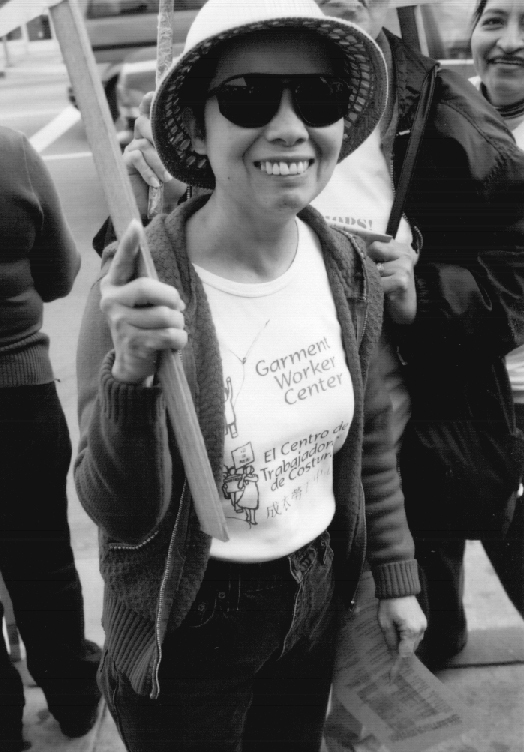 Saturday was a big anti-sweatshop worker's rights day in Los Angeles. This woman just looks like she's having a good time, and she's supporting the GWC. That's right on. No other reason for her photo than her big smile. Where else but in LA do you need a hat and sunglasses in the last two weeks of December? PS - keep you're eye on the calendar. This was the final picket. There's another F21 demo on the 30th that should be fun.